Brick Heads - Family Times is an award-winning magazine with staff-written news, feature stories and artwork that inform and inspire Central New York parents and their children. With a half-dozen two-by-four Lego bricks, a child literally has millions of different creations at his or her fingertips. A school today can become a rocket ship tomorrow. Multiply that by many more bricks of different lengths, widths, shapes and colors, throw in a few minifigurines (“minifigs”), and the possibilities are infinite. Understanding the potential of Legos is a math challenge in itself. During the work and play that follows, a child might develop social and creativity skills while also inadvertently learning about math, science and art. Today’s educators are embracing the connecting plastic bricks. Locally, several districts have hosted workshops for every age group from preschool to high school. Public libraries offer Lego play spaces for younger children and sponsor clubs where kids can hone their building skills and compete against other young people. According to The Lego Book, a Lego-commissioned publication written by Daniel Lipkowitz, Lego founder Ole Kirk Christiansen, an established home builder and furniture maker, opened a wooden toy workshop in 1932. He bought a plastic injection molding machine 14 years later and developed the interlocking brick in 1949. Lego’s system of play—the idea that every element should connect to every other element—was launched in 1954, according to The Lego Book. The company’s product line exploded after that, including every type of vehicle imaginable, landscapes, towns, monuments and eventually battery-operated sets. Lego figurines, which now accompany most themed sets, were created in 1978. The company eventually obtained rights to make products with Star Wars, DC Comics, Marvel Comics, Indiana Jones and Harry Potter characters, including video games. Lego amusement parks opened in California and later in Florida. There are many knock-off products, including Mega Blocks, makers of the popular Halo sets. And the Minecraft video game, an international bestseller for children as well as adults, was influenced by Lego’s success. Heather Feng, of Manlius, says her two children developed an interest in Legos when they were toddlers. The family picked up some Duplo blocks (larger pieces designed for smaller hands) at a garage sale, and Josiah, now 6, immediately favored them over his newer toys. He’s moved on to the Star Wars and Ninjago sets, while his younger sister, Julia, 2, has inherited the larger bricks. She likes to build animals, barns and fences, Feng says. “They just gravitated toward them,” she says. At 3, Josiah enjoyed a Lego walkie-talkie set and completed various designs of a car set. He fell “head over heels” for Legos, Feng says, after playing with the landscape sets. He’s been to the Lego Store in New York City, and he recently saw The Lego Movie. The family is planning a Lego birthday party for him. Feng says playing with Legos has sparked his curiosity about new things. Both of his parents are software engineers. Josiah likes to read their work materials, view architectural designs on their laptops and often asks about terminology used in their professions, she says. Josiah participated in a Lego Bricks 4 Kidz workshop at his school. The Central New York franchise of Bricks 4 Kidz, which was established in December 2013, offered after-school programs in three districts during its inaugural year and is expected to reach out to many more schools in the months ahead, says Maria Moore, owner of the Central New York franchise. The sessions were six weeks (one day after school each week) and served students in kindergarten, elementary and middle school. PowerPoint presentations explained scientific concepts like motion, inertia and friction, and the students would later demonstrate the principles using Lego creations. The older children worked on robotics sets where the Lego model was connected to a computer. They also did the programming that instructed the model how to move. “This fosters an approach to how things work,” says Moore, who became interested in tinkering as a child after watching her father and brothers work on the family car. She opened the Central New York franchise shortly after moving here from Albany because she wanted an enrichment program that could start with her own young children. Bricks 4 Kidz, which began five years ago and now has franchises all over the globe, seemed like the perfect fit. 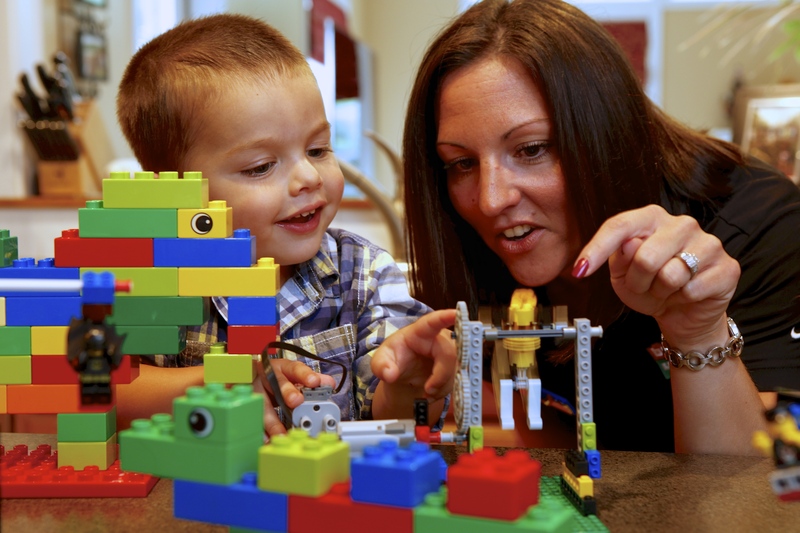 Stacy Fowler, of Cazenovia, says her two sons, 9-year-old John and 6-year-old Riley, also began their Lego career with Duplo blocks at a young age and participated in two Bricks 4 Kidz workshops during the previous school year. The first involved making animals and the second concluded with assembling a catapult that had moveable parts. The organized Lego play, Fowler says, inspired the boys to work together. At home, they prefer to play apart. Audrey Kissel says her daughter Anna, now 12 and a middle school student in the Jamesville-DeWitt district, got into Harry Potter-themed sets and then the Mindstorm Lego robotics kits when she was in elementary school. Her younger daughter, Kate, now 9, showed a mild interest in Legos while son Charles, now 6, was hooked on the blocks the day Anna shared them with him. Now, Legos are the only toys he’ll play with. Charles’ approach to Legos isn’t uncommon: He’ll follow the instructions to complete a set, play with it for a while, and then combine it with others sets to make his own creations, even if the themes—Harry Potter, Star Wars, super heroes or Lego City—are different. That’s not to say Legos are the perfect toy, or the only toy that promotes cognitive development, Kissel says. She likes that they are so durable and don’t break as easily as action figures or other types of toys, but they are also pretty expensive, especially the themed sets. While it’s not uncommon for children to prefer Legos over the company of other children, in doing so they can be controlling and unwilling to accept other ideas as a collective creative effort. Library-funded programs are helping with that task. Fayetteville Free Library, for example, features “Legos in the Café” every Wednesday after story hour. The program, which is aimed at toddlers and preschoolers, is to promote discovery through self-directed play, says Portier, the library staffer. 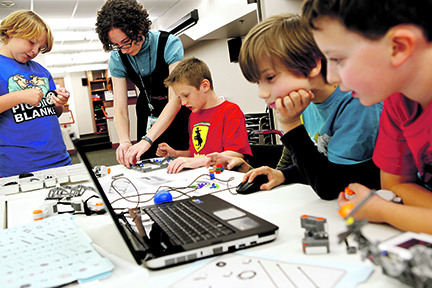 For the older children, the library has First Lego (ages 9 to 14) and Junior First Lego (ages 5 to 10) robotics teams where participants prepare for competitions against students from other districts. More than 30 children applied to be on the team, and 10 were randomly selected. There are currently more than 40 teams in the Central New York region. A team from Minoa won last year’s competition at SUNY Institute of Technology at Utica-Rome. As part of the competition, teams receive the assignment two to three months before the regional competition. In last year’s challenge, “Nature’s Fury,” teams had to build a robot that had to maneuver and pick up items in a 4-by-6-foot Lego sheet in less than two and a half minutes. Materials are provided to the team but instructions for building the robot are not, so students must work together to complete research, development and troubleshooting duties before assembling a tactical plan for their robot’s run, Portier says. Those who aren’t randomly selected to the First Lego team can still participate in the library’s Mission Lego Brainstorm sessions, a monthly program where children work in groups of four to complete Lego robotics projects. After reviewing tutorials, the kids bring their creations to life in the form of soccer players, gladiators, catapults, or robots that can climb stairs, Portier says. Legos are so popular now that kids naturally still want to build with them during the summer. 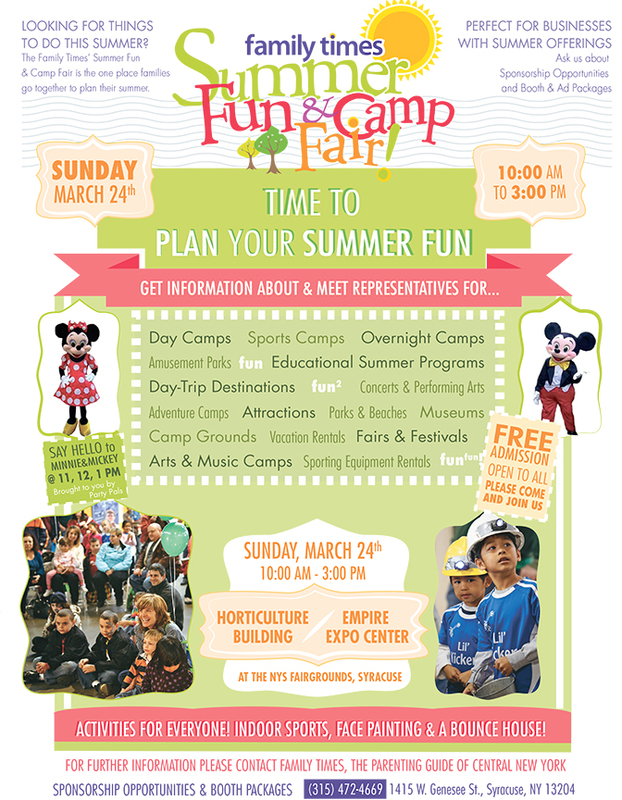 Bricks 4 Kidz even offered summer camps. Rachel Fishman, a sophomore at SUNY Binghamton, instructed Lego sessions this past summer in Fayetteville at Guzman’s Dance Studio. By the end of the weeklong session, most kids in the program, whether they were 5 or 12, knew how to follow instructions and did not need to ask for help on their projects, she says. Fishman, who is studying engineering, says she developed an interest in science after taking trips to Syracuse’s MOST (Museum of Science and Technology) with her father, an engineer. Legos and Lincoln Logs were her favorite toys growing up. She believes that programs like this could pique the interest of children who would otherwise not be exposed to the concepts of engineering at school or home.